UNDERSTANDING STEELHEAD BIOLOGY When steelhead trout enter tributary streams from Lake Erie in the fall and spring, they go through several stages. Bright fish, are those that have just entered a river. Once they settle down, these are the easiest to catch, since they have just left the lake and have not been previously exposed to lures, flies or baited hooks. Early in the season, water temperatures are higher and the first fall run steelhead are often the largest ones caught. Transition fish are those that are darkening and showing red or pink on their sides and gill covers. These generally are holding and not actively feeding. Spawning fish (March-late May) are on gravel beds and not feeding. However, they may make reaction strikes to flies that come close to their beds. Dropback fish are those that have finished spawning. They are very hungry and will actively feed. This is the second easiest time to catch steelhead (March through May). Water temperatures are usually warmest then. There are three phases of steelhead upstream migration. Moving fish are actively migrating upstream and do not hit when moving. Resting fish have stopped moving to rest – this is your first opportunity to catch them. Steelhead alternate between resting and moving. Holding fish are those that have found a place to remain when the water is too low to continue moving or they are no longer actively migrating upstream. Steelhead generally hold in deep holes, so target those. WHEN AND WHERE TO GO STEELHEADING Steelhead that are ready to migrate leave Lake Erie and enter tributary streams in the fall. 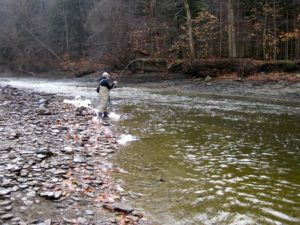 Prior to mid-November, it is best to fish the most easterly Ohio streams, such as Conneaut Creek and Ashtabula River. After December 1, any Ohio tributary stream will have fish, if conditions are appropriate. Fishing the lakeshore can be an option in early fall (Sept/Oct) or when rivers are full of leaves and become tannic- colored. Fish don’t like those conditions. Early morning is often the best time for shoreline fishing, but fishing can be good all day, particularly when cloudy. Casting from piers or river mouths can be effective. Try to locate corners or openings where baitfish are gathering. You don’t have to go deep, since steelhead will often be chasing baitfish in 1-8 feet of water. Big baitfish streamer patterns (Clousers) are the best flies. Casting parallel to the shore can be effective. If you don’t catch anything in 30 minutes – move to new location. In Lake Erie tributaries, major holes get the most angling pressure – everyone knows where those are. Targeting secondary holding areas that may harbor only a few fish can be a key to success by getting away from the crowds. Visit streams in summer when water is low to learn where these holding areas are based on bottom structure. UNDERSTANDING THE RIVERS The best steelhead fishing is usually when water conditions are changing, such as when water is dropping from fast to a slower flow, when water is clearing from muddy to medium visibility, and when very cold water is warming in mid-day. Water temperature is a key factor in steelhead behavior. Steelheaders should measure water temperature throughout the day to better understand what the fish are doing. Fish are cold- blooded, so their behavior is controlled by water temperature. Steelhead are naturally cold-water fish and their prime temperature is 40F. When water temperatures are colder, steelhead are found in slower moving water, because they don’t have the energy to hold in faster water. When water temperature is in the low 30s, they are in the “frog water”, ie. still water that is not moving at all. Eyes are a fly fisherman’s best tool! Carefully observe the river you are fishing, noting all conditions. When approaching the river, stay onshore and fish closer, slower areas first, then cast further and further out. Cover an entire area systematically. However, if you are not catching fish within 30 minutes at one location – MOVE. Move to a new location or even a new river, rather than remaining in one place. The warmer the water, the more frequently you should move if you are not hooking fish – they may not be there! THE IMPORTANCE OF STRUCTURE Stream structure will dictate where fish will be located. Structure may be physical, such as rocks or logs. River bends give the most structure suitable for steelhead holding, thus parts of the river with the most bends will yield the most places to fish. Long, straight stretches are usually not productive. Many Lake Erie tributaries have big shale cliffs. At both ends of these cliffs, where they meet the woods, are good places to find steelhead. Usually right in front of the cliffs the rivers have scoured out shale bottoms. However, at the ends are transition zones where shale shelves lead into broken shale or gravel. Steelhead tend to line up along where smooth shale abuts broken shale. In some places there are “elevator areas” where stream depth changes abruptly just below rocks or shelves. Steelhead often hold right below these areas before moving through them. “Invisible” stream structure, such as water currents and seams, is also important to steelhead. River pools have three sections: head, gut, and tailout. Fish will hold in one or two of these three sections, depending on conditions, but not in all three at once. Fish will be in a tailout section when water visibility is 14-30” and water temperatures are in the high 30s to low 40s. When water has dropped to <14” visibility or is mid-30s or colder, fish will not be in tailouts. The head of a pool is often 1½ to 3 feet deep. Steelhead will hold right at the edges there with their noses against the shale dropoff. Thus, at the head of a pool, you must get the fly down fast or will it will float right over them and they’ll never see it. When fish are not moving and stream water has dropped, steelhead will usually be found in the deeper gut of the pools. Seams are where fast water meets slower water in the river flow. Fish relate to seams, but water temperature is also a factor on where they will be. In water in the upper 30s or warmer, fish will be at the edge of a seam near the faster water. In the mid-30s, fish will be in slower water further from a seam. If water temperature is 33-34F, fish will be in the slowest water where it is hard to get a good drift with your indicator. When fishing this slow water, you may even have to help move the indicator along. “Funnels” occur where the water makes a large “V” downstream. All fish moving upstream must move through this structure. After moving through the funnel, they tend to rest just upstream. That is a good place to target when water is high and fish are moving. WATER FLOW RATE AND CLARITY River flow rate and clarity are critical factors for success. When Lake Erie tributaries are high and muddy, they tend to clear from the source to the mouth. However, the Grand River clears from the mouth upsteam to Harpersfield Dam, because sediment is held above the dam and is continually released. When rivers fall quickly (early in season), they will remain muddy for a time, even when low. When they fall slowly, as they do in the winter, they are usually clear when lower, because silt has had time to settle out. For steelheading, the perfect flow for all Lake Erie tributaries is 200-250cfs. A section of stream that has a flow about the same as a person’s normal walking speed, is a good place to fish for steelhead. The best water clarity for successful steelheading is 18-24” of visibility. That is when you can barely see your boots in knee-deep water. In high water with fairly low clarity (<12” visibility), fish are in “walking speed” water. They can’t hold in water faster than that, so don’t fish there! At <8” of visibility, steelhead are very difficult to catch because they can’t see the flies. FLY PATTERNS FOR STEELHEAD The top three steelhead fly patterns for nymphing are caddis fly, black stonefly, and egg patterns. Steelhead are sight feeders, so they must be able to see the fly to take it. Size and color are the most important factors, not necessarily a specific fly pattern. Thus you need three sizes of flies. In high water with low clarity, larger fly patterns (size 4-6) are needed so fish can see them. In medium clarity water, flies of size 10-12 are appropriate, and in very clear water, size 14-16 flies may be required. The best colors generally are olive, white and black. It is appropriate to have some synthetic materials incorporated into all patterns to improve their attractiveness. Use of the popular UV materials may improve visibility where water clarity is limiting. With egg patterns, something that gives a “halo” image, like a veiled egg (nuclear egg), may improve attractiveness. Plastic beads often will outfish tied egg patterns because of their neutral buoyancy. The speaker carries 20 nymph patterns in three sizes and has them in boxes of large (6-10), medium (12-14), and small (16- 18) flies. Steelhead can be caught on dry flies, but only in really clear water where fish can see the flies on surface. Early (Sept/Oct) and late season (April/May) are the best times to try dry flies. RIGGING THE LINE The leader should be at least the length of the rod and should have 14-18” of tippet in front of top fly. Split shot can be placed 2 feet in front of the top fly in clearer water. If the water is colder, faster, or muddier, split shot should be placed closer to top fly (8-12”). This will keep the flies closer to bottom where fish, that may not be willing to move, can see it more readily. In cold water, fish will barely move, so flies need to be put right on their noses. Three sizes of strike indicator are useful. If water clarity is low (visibility <12”), a big indicator can be used without fear of spooking the fish. In clearer water, a smaller indicator is required to avoid spooking fish. When fishing with an indicator, one needs to watch it constantly to see that it is “ticking” along fairly readily, showing contact of the rig with the bottom. In faster water, the split shot should be ticking along the bottom. In slower water, generally only the bottom fly will be ticking the bottom. The position of the indicator on the leader above the top fly must be adjusted constantly to control the speed of the drift by interacting with bottom structure. The appropriate placement will continually change as water depth varies between different drifts and even through various parts of a single drift. These notes were prepared by Randy Rowe based on Jeff Liskay’s presentation at the December 8, 2014 chapter meeting.